British Columbia Packers Limited was formed in 1928, following a series of amalgamations with predecessor companies, and rapidly evolved into a prominent fish processing company. Due to a policy of product diversification, British Columbia Packers Limited operated fishing stations, canneries, fresh fish branches, fish-curing establishments, cold storage plants, reduction plants and shipyards. The company also had a half interest in a whaling station and operated several general stores. After the Second World War, British Columbia Packers Limited rapidly began to expand its business interests outside of British Columbia. It acquired sales offices and production facilities in the United States (Certi-Fresh Foods, Los Angeles), fishing operations in Peru, and by the 1960s it had expanded to the east coast of Canada. At the peak of its operations, British Columbia Packers Limited acquired international success with markets for canned seafood ("Clover Leaf"); fresh, frozen and prepared fish products ("Rupert Brand" and "Certi-Fresh"); and for the products of reduction plants. In 1968, British Columbia Packers moved its head office from Vancouver to its final destination on Moncton Street in Steveston (Imperial Plant site.) The early 1980s introduced a period of major change and restructuring in the fishing industry as a whole, a factor which directly impacted the British Columbia Packers Limited. By 1997, its operations had dissolved and its successor company, BCPL Limited, owned by George Weston Limited, undertook the disposition of British Columbia Packers real property and other assets. 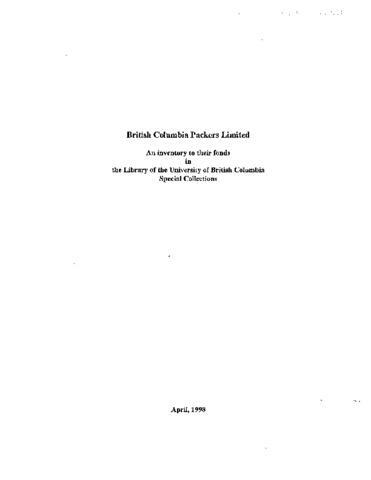 The fonds consists of records generated by British Columbia Packers Limited, its predecessor bodies, and individual canneries and plants owned by the company. In addition to financial records, it includes plant appraisements for various canneries and properties owned by B.C. Packers Ltd., as well as Canadian Fish and Cold Storage Company Ltd., Coast Oyster Company, Edmunds and Walker Ltd., J.H. Todd and Sons Limited, Nelson Bros. Fisheries Ltd., Nelbro Packing Co., Queen Charlotte Canners Ltd., Rupert Fish Co. Incorporated and Western Canada Whaling Company Ltd. Those canneries and properties include Alert Bay Cannery, Bella Bella Cannery, Boswell Cannery, Celtic Shipyards, Imperial Plant, Kildonan, Klemtu, Ladner Cannery, Masset, Namu Cannery, New Westminster Cannery, Paramount Cannery, Port Edward Cannery, Prince Rupert Plant, Quathiaski Plant, Richmond Plant, and St. Mungo Cannery. In addition, the fonds consists of fifty printer's blocks for producing lithograph salmon tin labels and approximately 100 plastic cards used for advertising fish products. Also included are miscellaneous items such as the Roll of Honour of the B.C. Canning Company listing men in service during World War I, Fraser River charts (ca. 1929-1947), a sample of receipts for tram passes to B.C., and a framed sheet describing the history of the Bella Coola camp. Boxes 16 to 20 contain printing plates and unprocessed materials.